At S&L Roofing, we specialize in residential roof inspection, maintenance, and repair, and have decades of experience performing these services on all types of home roofing systems in Irvine and throughout South Orange County. 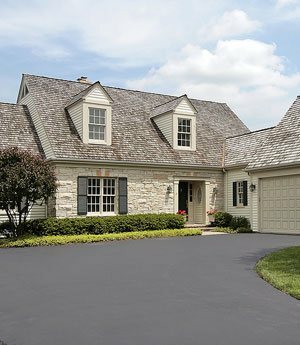 Over the years, we have provided our exceptional quality, affordably priced roofing services to 1000's of satisfied homeowners throughout our service area, and possess the knowledge and expertise necessary to resolve any and all home roof maintenance and repair issues in an effective and cost-efficient manner. 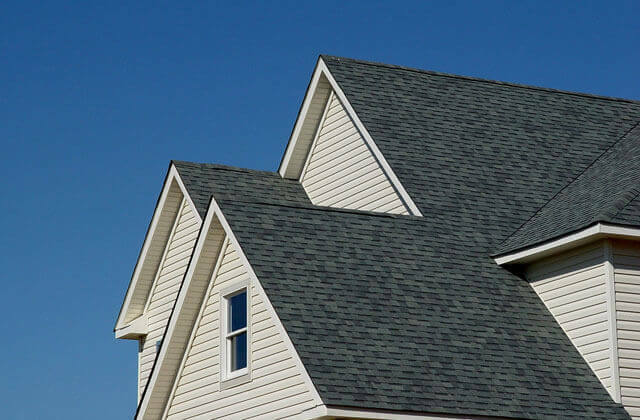 At S&L Roofing, we perform all of our competitively priced roof maintenance and repair services with the long-term health and functionality of your Irvine home's roof foremost in mind. No repair job is too small for our skilled and experienced roofing professionals, and we pride ourselves on getting to the source of your roof's problems, and then resolving these issues in the most effective and affordable method possible. We carefully match our roof repairs to the roof's existing roofing material, and precision-install all roof repairs to blend perfectly with the roof's existing design layout. Call us today, and depend upon the roofing inspection, maintenance, and repair specialists at S&L Roofing to keep your home's roof in the best condition possible, at very competitive rates. We provide our affordable roof inspections to Irvine and all of South Orange County, and offer free onsite maintenance and repair estimates throughout our service area. Irvine wood shingle roof systems are subject to weathering over time. They tend to dry out unevenly when wet, leading to shingle curling, which inhibits their ability to shed water. In addition, this shingle curling leads to the subsequent development of roof leaks when the curling causes the paper underlayment to be exposed. 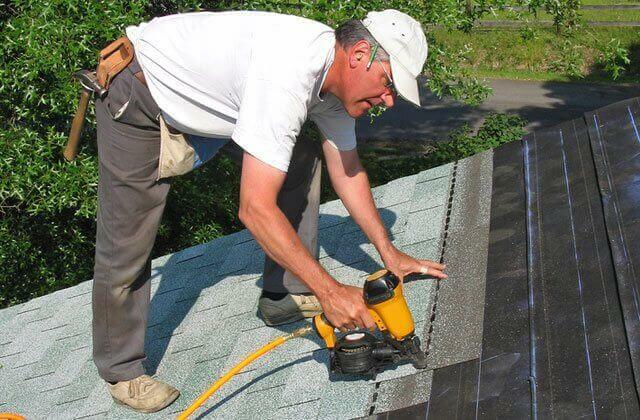 Irvine composition shingle roof systems possess Class A fire resistance and are generally easy to maintain. 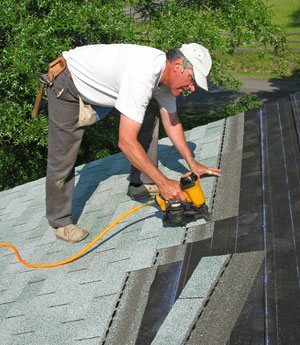 However, they do tend to suffer from ridge cap failure, which provides water an entry point underneath the composition shingle layer, leading to roof leaks. Over time, wood shake roofing systems in Irvine fall prey to the weathering effects of sun, wind, and rain, disintegrating to the point that the paper underlayment beneath the wood shake layer becomes exposed. The newer wood shake roofs are treated to be Class B fire rated, but this fire retardant treatment causes the shakes to weather even faster than older, non-treated wood shakes, greatly shortening roof lifespan. 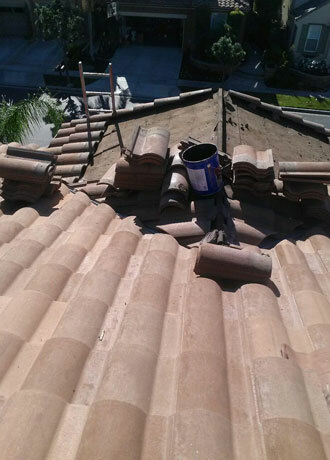 Clay and cement tile roofs in Irvine are often not installed using the best methods possible, which can lead to roof problems such as tile slippage, exposed felt, and consequent roof leaks as they age. Over time, tile mortar tends to crack and corrode, and must be repaired or replaced. In addition, the buildup of debris on tile roofs in roof transition areas can inhibit proper roof drainage and lead to eventual roof damage. Ponding water is a major problem for gravel and cap sheet flat roof roofing systems in Irvine when the gravel and cap sheet layers become damaged. This damage enables standing water on these roofs to seek exposed nail holes and any other poorly sealed roof penetrations, causing roof leaks. S&L Roofing's comprehensive home Roof Tune-Ups are designed to alleviate potential Irvine residential roof issues before they even have a chance to develop. During our home Roof Tune-Ups, we carefully assess every aspect of your home's roofing system, and determine which maintenance and repair services are needed, if any, to keep your roof in optimal condition. 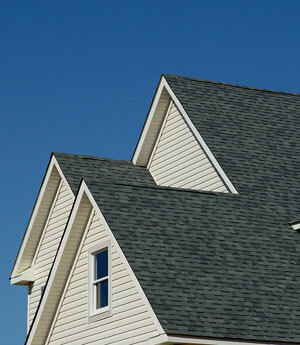 Don't neglect your roof until major problems develop, call S&L Roofing today to schedule an affordable Roof Tune-Up. Expert roof maintenance and repairs. 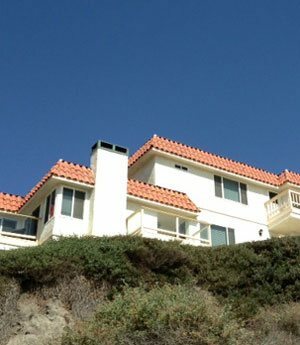 For all types of Irvine residential roofing systems: clay and cement tile roofs; wood and composition shingle roofs; wood and cement shake roofs; metal roofs; and cap sheet and gravel flat roofs. All repair work performed to blend seamlessly with the existing roof's roofing material; the existing roof's design layout. 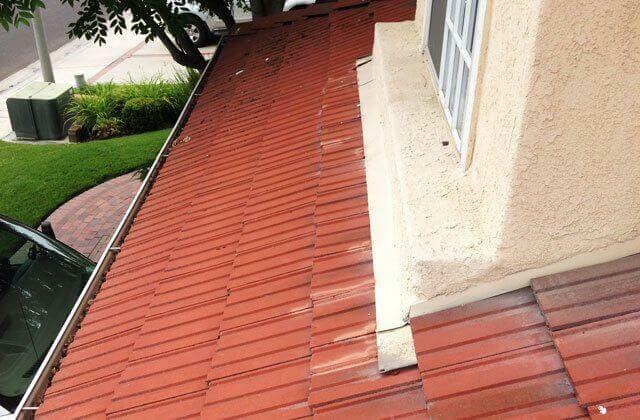 Roof Tune Ups: a cost effective preventative roof maintenance service for Irvine homeowners. Roof power washing; rain gutter cleaning. Free onsite maintenance and repair estimates to all of South Orange County. The performance of a thorough roof inspection is the only means of accurately evaluating the current state of health of Irvine residential roofing systems, and of determining which maintenance and repair services are needed, if any, to ensure proper roof function over the long term. During our thorough roof inspections, we check for missing or cracked shingles or shakes; damaged mortar and tile slippage on tile roofs; and blistering or exposed paper on cap sheet or gravel flat roofs. In general, we concentrate our inspection efforts on typical roof problem areas, such as those near skylights, solo tubes, plumbing vents, kitchen exhaust vents, b-vents from water heaters and furnaces, chimneys, air vents, roof transitions such as parapet wall connections and roof to wall connections, roof drains, roof scuppers, crickets, and valleys. During our inspection, we assess the integrity of the roof's ridge cap, and evaluate the condition of the roof's sheathing and paper underlayment. We determine if there is any termite or dry rot damage, and look for excessive debris buildup. And only then, after completing this in-depth inspection procedure, do we determine if roof maintenance or repair services are necessary. Trust the Roof maintenance and repair specialists at S&L Roofing to care for your Irvine home's roof, and keep it functioning optimally for as long as possible. 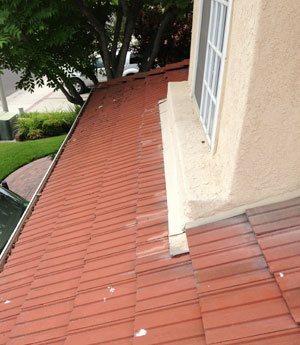 We provide our roof maintenance and repair services to the entire South Orange County area, and provide free onsite repair estimates for our valued clients. Call us today. 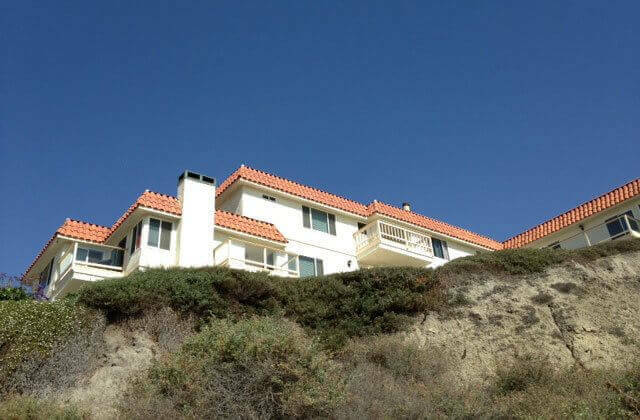 Before: A homeowner in Irvine, CA called S&L Roofing because water was coming down inside the home (along the wall and top of the window in the master bedroom). By performing an inspection of their roof to identify the source of the leak, we found that the mortar along the ridge had broken up. This caused the water to get under the tiles and the underlayment to deteriorate. 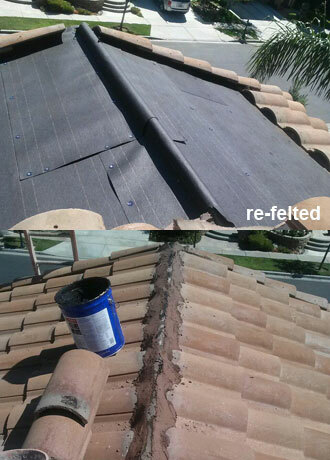 After: To complete this roof leak repair in Irvine, CA, S&L Roofing picked up approximately 200 square feet of tiles. We then re-felted and put new mortar over the entire leak area, before replacing the tile. Our roof repair not only reused the homeowner's pre-existing tiles, but also took care of the problem and helps to prevent future water intrusion.